"He's the leading architect in the world today." Architects resides in that nether zone somewhere between artists and technicians—they have to balance their aesthetic ambitions with the pedestrian practicality of actually putting up a building, and having it stay up, and having it work properly. Frank Gehry's reputation is surely more as a creator than a craftsman; he may well be the most publicly identifiable architect since Frank Lloyd Wright. This documentary is an almost worshipful look at the man and his work, made by his friend Sydney Pollack, who just happens to be a filmmaker of the first rank. The result is not a soup-to-nuts Ken Burns-style biography, nor a Maysles-inspired piece of vérité, but an affectionate if not exhaustive portrait. From the jump, Pollack acknowledges that he's no expert on architecture, but on some level he and Gehry seem like kindred spirits, and the director is very much present in the film, asking probing questions, drawing parallels between his subject's field and his own. Pollack also gets some of Gehry's patrons to extol the virtues of the architect's work, and this bunch seems like our contemporary Medicis—Michael Ovitz compares Gehry's work to Cubism, Michael Eisner extols Gehry with a stuffed Mickey Mouse in the background, Peter Lewis blithely discusses paying $6 million in fees for a project never built. But certainly the true star is Gehry himself, who is disarmingly candid—he discusses his Canadian childhood, his contentious first marriage (his former wife insisted, among other things, that they change their surname from Goldberg to Gehry, and the architect's conflicted relationship with his Jewish heritage is a subject of discussion), and he even permits Pollack to interview his therapist. It's a treat to see him at work—he's very much in touch with the creative instincts that too many of us shucked off after childhood, and Gehry knows that on some level he gets to play with blocks for a living. He's well served by his extensive staff, who understand his instincts, and have learned how to translate them into buildable blueprints. Actually, the true stars of the movie are Gehry's buildings. Pollack has shot the movie with handheld high-end video cameras, and was able to travel the world to see Gehry's most notable work—the fluid, moving camera does as well as possible in giving us a sense of the three-dimensional works on a two-dimensional screen. This isn't a catalogue raisonné, thank goodness, and the focus is on just a couple of buildings, including the Guggenheim in Bilbao, Disney Hall in downtown L.A., and early, formative efforts in Southern California, including a couple of horrid missteps, such as the ghastly shopping pavilion, Santa Monica Place. 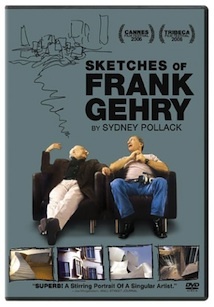 Hal Foster of Princeton appears as the sole detractor from Gehry's genius, but Pollack's treatment of the criticism is a little half-hearted, and it's clear that the director's sentiments are with unabashed Geary fans like Dennis Hopper and Julian Schnabel (who's in shades and a bathrobe, with a cigar and a cocktail). And you don't need to know a whole lot about architecture to wonder if the analysis here is a bit facile. Gehry seems to have commodified himself with a great degree of success, and a Gehry-designed building with its titanium curlicues has become how a well-dressed city now accessorizes itself, the urban equivalent of a polo pony on your chest or the latest iPod or tiniest cell phone. But do they work as buildings? Would you want to live or work in one of these, every day, for decades? I'm not sure, but on some level those are the important questions, because the novelty and the fanfare quickly become things of the past. But this movie is less about that, and much more about the architect as rock star. And certainly nobody is selling out the big rooms any faster these days than Frank Gehry. Rock on. Image Transfer Review: The movie was shot on video, and it's generally pretty well transferred, but, as with other features made under these circumstances, contrast is cranked up a bit too high. Audio Transfer Review: A fair amount of ambient noise spills in during the interview footage, but again, that's to be expected with a documentary of this sort. Extras Review: The one extra of note is a Q and A (34m:09s) with Pollack, led by director Alexander Payne, following the Los Angeles premiere of the film. Pollack seems to be a bit of a faux naïf here, both about architecture and about documentary filmmaking, but he's one of those guys who's always fascinating when he's talking about process. He discusses making this project on odd available weekends, and its inception, when he was able to cut out on a junket to attend the formal opening of the Guggenheim in Bilbao, and got a personal tour from his old friend Gehry. A loving portrait of perhaps the most highly regarded architect working today, but a piece that functions better almost as a dialogue between masters of different disciplines than as a full-blown study of Gehry.